As a matter of fact, if you haven’t experienced Mr. Chris Wojo… (we can’t pronounce it either) presentation on the Lesner, you’re in luck! This coming Saturday June 20th 9am at Dockside he will be offering his very entertaining update which includes a lively Q&A. It’s for Lynnhaven Colony’s Civic League Meeting and the public is welcomed to attend. We strongly encourage you to do so. Put those thoughts of snow plows and sand and salt on the road while a cold wind whips off the bay out of your mind . . . . . and just enjoy this heat! Soak it up and savor the summer days living in Virginia Beach. Progress on the Lesner Bridge Replacement Project is moving onward, and you can see the progress almost on a daily basis. Below is the latest collection of facts and figures and snappy photos – updated for your reading pleasure – from Chris Wojtowicz, infamous engineer and project manager. Please add this to your paperbacks and magazines for great reading while on the beach. Feel free to let Chris or me know if you have any questions or need more information. Enjoy the summer weather, avoid the skeeters . . . AND STAY COOL AND SAFE! The heat is on – and not just the temperature. With lost work days during this past winter McLean Contracting is re-sequencing work, adding more resources to the project (can we fit any more cranes in the Lynnhaven? ), and working weekends to make up for the lost days on the schedule. 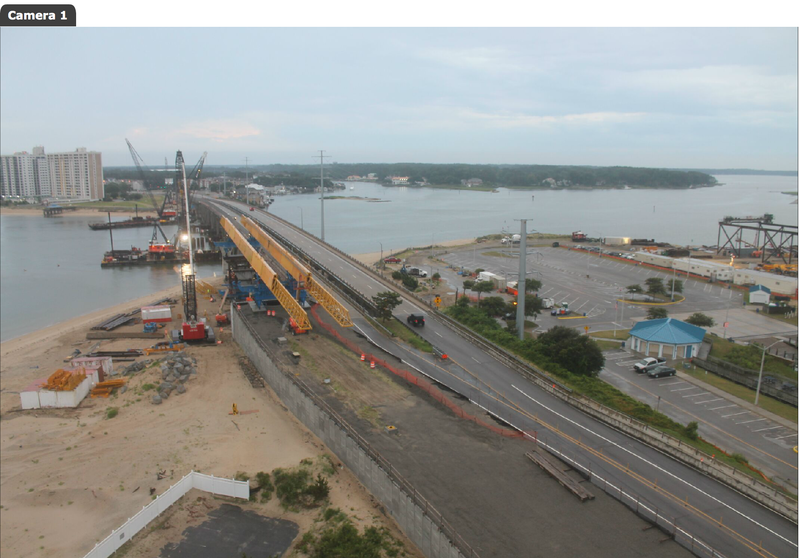 Their efforts to make up the lost time are certainly having a positive impact on the construction of the new westbound Lesner Bridge. Temporary Trestle, Support Barges, and Cranes working concurrently on piers 3, 5, and 7. As the segment launcher (gantry crane) comes together between piers 1 and 2 of the new westbound bridge, the casting yard is preparing the completed bridge segments for shipment. A total of 49 of the 177 bridge segments have been cast and is enough to complete 3 of the 10 spans in the westbound bridge. The first bridge segment to be placed will be the expansion joint segment. This segment will be installed on Abutment “A” near 3556 On the Bay condominiums and will likely take place the first week of August 2015. Remember to check out the Lesner Bridge Construction Sequence Animation on YouTube! While the segment launcher is being assembled, crews will be busy placing the reinforcing steel for the concrete cap in Pier 3 which is expected to be poured this week. Additionally, drilling crews have completed installing all of the drilled shafts for Piers 4 and 5 and are on track to complete the shafts for Pier 7 later this week before moving on to Pier 6. At the same time, a separate foundation crew has begun driving the steel pile foundation for Abutment B of the new westbound Lesner Bridge (next to the Point Chesapeake property). That’s it for now. Keep Cool and Drive Safely!